ANN ARBOR, MI – Only a small percentage of people in their 50s and early 60s have had their DNA tested – either for medical reasons, to learn their ancestry or out of curiosity – but far more have an interest in getting such tests done, according to a new poll. One in 10 have taken genetic tests offered directly to consumers, and one in 20 have taken genetic tests ordered by a doctor, according to new findings from the National Poll on Healthy Aging. More than half expressed interest in getting DNA tests to guide medical care, understand health risks or know their ancestry. Still, the poll finds, that desire to know more about their risk of disease or heritage comes with a grain of salt. Two thirds of those polled said they thought genetic testing could lead them to worry too much about their future health. The poll of 993 adults between the ages of 50 and 64 was conducted by the University of Michigan Institute for Healthcare Policy and Innovation, and sponsored by AARP and Michigan Medicine, U-M's academic medical center. It comes at a time when the U.S. Food and Drug Administration has approved several disease-specific tests to be marketed directly to the public, instead of requiring a physician to order them. 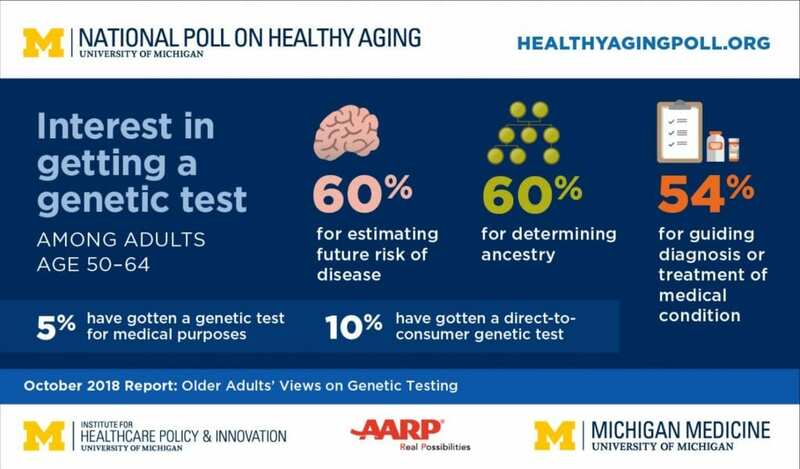 The poll also asked respondents their interest in testing to learn their genetic risk for three later-life disorders: Alzheimer's disease, Parkinson's disease or macular degeneration. Around two-thirds had at least some interest in each test. Scott Roberts, Ph.D., a professor from the U-M School of Public Health who has studied use of genetic testing, including direct-to-consumer testing, worked on the poll's design and analysis. He notes that even those who get direct-to-consumer genetic tests mainly to learn about their ancestral heritage could end up being "blindsided" by findings showing that they have a high risk of diseases such as Alzheimer's. "Compared to previous findings in the general adult population, this age group appears to be a little more lukewarm about their views of the benefits versus the risks of genetic testing overall," he says. "The majority said they might be interested in knowing their risk for specific conditions, but on other hand they were worried about potential psychological distress from the results." Roberts points out that the accuracy of any genetic test is not 100 percent. He also notes that testing ordered by physicians often comes with a chance to meet with a genetic counselor – a specially trained clinician who can help patients decide whether to get tested, prepare them for handling the results, and help them understand what the results do and don't mean. By contrast, direct-to-consumer testing often comes with none of these services, and individuals who buy DNA tests directly may encounter difficulty in interpreting them, or getting access to a genetic counselor after they receive their results. Genetic counselors are already in high demand for clinical cases, and their appointment times are prioritized for those who have a clinical reason for DNA testing, including family history of a serious genetic illness. "Patients may not think about the downstream effects of direct-to-consumer genetic testing. An unexpected positive result may lead to several additional tests that may or may not be covered by insurance," says Preeti Malani, M.D., director of the poll and a professor of internal medicine at the U-M Medical School who has special training in geriatric medicine. The five percent of the poll respondents who had already had a genetic test ordered by their physician said it was done either because the physician suggested it or because they had wanted to find out more about their risk of disease or how best to manage a current condition. Ten percent had had a direct-to-consumer test. More than 70 percent of them said they were interested in learning more about their ancestry, and just under half said they were just curious about their genetic make-up. Just over one in 10 said they got tested to find out more about their health in general, or their risk of a particular disease. Combining the two types of genetic testing, 14 percent had had either kind. "We're living in an era when advances like DNA testing are providing an amazing amount of useful health information," says Alison Bryant, Ph.D., senior vice president of research for AARP. "As genetic testing becomes even more sophisticated and common among older adults, the challenge will be to ensure that people understand the benefits and limitations of these tests." Roberts, who specializes in genetic testing for Alzheimer's disease, notes that 70 percent of poll respondents had an interest in learning their Alzheimer's risk. Newer clinical trials of drugs that aim to prevent, delay or slow progression of memory loss and other cognitive problems are actually looking to enroll people who have a higher-than-usual genetic risk of Alzheimer's. So those who elect to buy such a test, or whose doctors order one for them because of family history, may now have an action they can take based on their results. "Before, there wasn't much we could recommend, but now there are more research opportunities to take part in, and we know more about health behaviors earlier in life that can affect the risk of Alzheimer's and other forms of dementia later in life," he says. Poll respondents seemed to understand how genetic testing provides a potential window into the future, both for their own health risks (90 percent agreed with this idea) or for those of their children and grandchildren (86 percent). But 41 percent said that a genetic test wasn't necessary if they already know what disease risks run in their family. The poll results are based on answers from a nationally representative sample of 993 people ages 50 to 64. The poll respondents answered a wide range of questions online. Questions were written, and data interpreted and compiled, by the IHPI team. Laptops and Internet access were provided to poll respondents who did not already have it.